My 5-year old will be getting her first Barbie this Christmas, and I’ve thought long and hard about which one to buy her. Barbie Fashionista has won me over! With her poseable arms and legs, she seems to be a nice transition from a soft doll. With 12 points of articulation, these dolls can pose in over 100 different ways. Each has a different personality that is reflected in her clothes and accessories. Though they may have slightly different styles, they’re all chic! 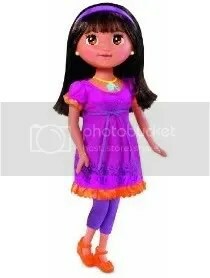 Each doll comes with purse or fashion accessory and retails for $11.99. Collect all six! Click here to buy online. I would have loved this when I was little! It’s an innovative way for girls to design their own fashion line. The best thing is that no sewing is required! Just select a fabric, wrap it around the dress form, and secure it with the exclusive style lock on the back. Each set includes fashion accessories (belt, etc. ), fabric swatches, and rhinestone stickers. Several assortments are available, retailing from $12.99-$39.99, depending on the set. Click here to buy online. You can’t hold this adorable panda and refrain from giving him a big hug! Press his paw and he’ll make realistic bear sounds. He loves to play peek-a-boo and will even move his arms up to his face to cover his eyes. My little ones love this! Luv Cub Panda will get hungry after all that playing, so he comes with his very own bottle to quench his thirst. If you feed him too much, though, he’ll get hiccups! Luv Cub Panda also comes with an adoption certificate, and requires three ‘C’ batteries, which are included. Retails for $49.99. On sale for $29.99! Click here to buy online. Dora has a new more “grown-up” look and can be plugged into a computer, via USB, so that girls have access to her online world. Help Dora and her friends – the Explorer Girls – solve mysteries through playing games. What I found really neat when I played with Dora Links is that you can change her hair length, eye and jewelry colors just by changing a few settings with your mouse. You then watch the changes magically appear right before your eyes! Dora Links comes with a doll stand, USB cord, purse, shoes and brush, and retails for around $50. Unfortunately the doll isn’t Mac-compatible yet, but hopefully will be soon! Click here to buy online. The I-Dog speaker has always been one of my favorite iPod accessories for kids. You have to admit, it’s a fun way to listen to music! The newest pooch to join the I-Dog family is the I-Dog Soft Speaker. Just plug him in to your music player and the plush-like gadget plays your music through his built-in speaker or your headphones! The lights on his face flicker and his ears move to the beat of the music. You can also place him near a speaker, press his nose, and watch him dance along. One of my favorite features is the little pocket that can hold my iPod. Comes in white, pink, or light blue. Retails for $34.99. Runs on three “AA” batteries, which are included. Read all about the ’09 I-Dog line. Click here to buy online. This set lets kids create thousands of unique alien figures with the twist of a knob. Four alien figures with interchangeable alien parts are included. By placing five different alien parts in the chamber and twisting the knob, kids can create a different custom Ben 10 alien creature every time. The Alien Chamber unit turns into a carrying case for storage and travel. Retails for $39.95. The alien parts are very little, so this is definitely not appropriate for young children. Click here to buy it online. Have you seen the CG-animated film Astro Boy? It’s a classic superhero story about a young robot with incredible powers and his adventure-filled journey in search of his identity and destiny. I’ve seen the toys based on the movie, and know they’ll be a huge hit this holiday season! The line of toys includes action figures, electronic toys, role play products and other accessories. The action figures are highly detailed and allow children to recreate their favorite scenes from the movie. 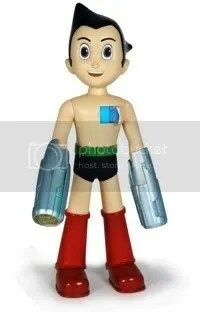 There’s also a ten-inch Astro Boy electronic figure, which is a little pricier, but features light up boosters, cannons and a light up chest core. For younger kids, there’s an Astro Boy Plush Collection, soft enough to take to bed. Products range in price from $5.99 – $19.99. Click here to buy online. Another fun animated film, Planet 51, will come out in theaters at the end of this week (11/20). It’s an action comedy featuring the voices of Dwayne “The Rock” Johnson, Jessica Biel, Justin Long, Gary Oldman, Seann William Scott and John Cleese, that follows American astronaut Captain Charles “Chuck” Baker as he discovers a planet inhabited by little green people happily living in a white-picket-fence world. Unfortunately, the inhabitants of Planet 51 think Chuck is the alien! The product line that goes along with the film includes action figures, vehicles, plush toys and RC toys. I played with a few of them, and one of my favorites is the 5-inch RC Rover. Complete with lights and sounds, he’s Chuck’s trustworthy robot companion and will take the direction you choose as the two of you set out on your own adventures here on Earth! Planet 51 products range in price from $6.99 – $29.99. I have a feeling many Dads will be buying this for their sons, because it’s just as fun for them to play with! One of the biggest Transformers toys ever made, the Devastator is actually six toys in one. It consists of six smaller construction vehicles, the Constructicons, that are painted in earthy colors suited for their rough construction jobs. There’s a bulldozer, a dump truck, an excavator, a scoop loader, a mixer and a crawler crane. Some of the pieces are tricky to snap together and pry apart, but the challenge is part of the fun! With its motion-activated sounds and movie-accurate detail, this toy is great for young fans and older collectors alike. Retails for $109.99. On sale for $74.99. Click here to buy online. These are no ordinary tops: by using the power of magnets, you can actually direct where your tops go as they’re spinning in the Battle Striker arena. Each Battle Striker has its own name and features, differing designs and themes, and come in varying sizes and hefts. Their differing sizes and densities shape how each of them handles in “battle.” The two included with this set are Mauler – a ferocious top that specializes in quick attacks – and Turbine, whose heavy weight helps him defend against attacks. You can even mix and match parts from different strikers to make your own, personalized striker. Retails for $39.99. Click here to buy online. Kids under 5 would probably enjoy this, but from personally playing with a Trio set, I’d recommend it for kids 5 and up. There are lots of small pieces, and some of the sets are a little complex. That said, the Trio building set is a lot of fun! All the pieces – bricks, sticks, and panels – click and hold together so that kids can build whatever they can think of! The Trio building set includes 100 pieces in a convenient storage tub. The storage bin lid doubles as a building base. The building set retails for $29.99. Other sets are available! Click here to buy it. Candy Land is a favorite at our house! This new version lets you experience the adventure in 3-D! Control the length of your game, build and customize your path and discover new places and friends. King Kandy is hosting a grand celebration and everyone’s invited to his castle! The first player to reach the castle with all their treats wins, but watch out for that tricky Lord Licorice! He’ll try to block your path. For 2 to 4 players. Retails for $19.99. Click here to buy it. I reviewed Little Passports earlier this year, and think it would make a great gift for that “hard to buy for” child on your list. It’s a subscription-based monthly mailing that provides kids with a unique way to learn about other countries and cultures. Sign up for a membership and the Explorer Kit, pictured to the left, is the first kit that your child receives. Every month thereafter, for as long as your subscription lasts, your child will receive a new package from Little Passports with unique souvenirs and gifts from that month’s featured country. A Little Passports subscription will run you $10.95 a month, including shipping. A portion of each subscription purchase goes to select children’s charities. Visit www.littlepassports.com for more information. When I saw this unique way to make our own stuffed animals at home, I knew my daughters would love it! With Printies Design Studio, all you need is your computer and inket printer, and you’re all set to create a custom plush stuffed friend! There’s absolutely no sewing, gluing, or cutting, so even the youngest kids can do it with an adult there to help out. Each kit comes with everything you need – including pre-sewn fabric sheets, stuffing, a stuffing tool, and a unique online passcode, which allows you to design your stuffed animal on the MyPrinties.com website. Once you’ve finished, just print it out, tear from the sheet, stuff, and seal shut with a pair of shoes. An easy and fun craft! Each Printies Design Studio retails for $19.99. Three themes – Ocean, Pets, and Jungle – and 6 sets to choose from. Read my review. Click here to buy online. Every wonder what to do with old, broken crayons? Melting them down to create new ones seems like a good idea, but how many of you actually do that? The Crayola Crayon Maker makes this easy and fun to do! Used with adult supervision, this handy gadget allows kids to make new color-swirl crayons out of their old, worn-down ones. It’s fun to experiment with different colors, and the clear lid lets kids watch as the crayons melt. The one drawback is that there is a 20 minute wait or so until the crayons are completely ready, so little kids may get impatient. The kit comes with 8 crayons to start you off! Retails for $29.99. Click here to buy online. Grown-up Dora?! That’s news to me, I never thought of anyone thinking about something like that!